Kicking off 2018, our French Winophiles group digs into two appellations in southern France within the Languedoc: Corbières and Minervois. This is where several organic and some biodynamic wines true to their terroir are found. And where value, variety, and consistency are present and winemakers experiment and innovate. I received two sample bottles, sharing one at a small dinner gathering with friends: people less schooled in wine, but who know what they like. It was a great an opportunity to get each person’s feedback, discussing the wine in detail. The Languedoc lies below the center of the country in the basis of the Mediterranean, and stretching from Montpellier to above the Spanish border. 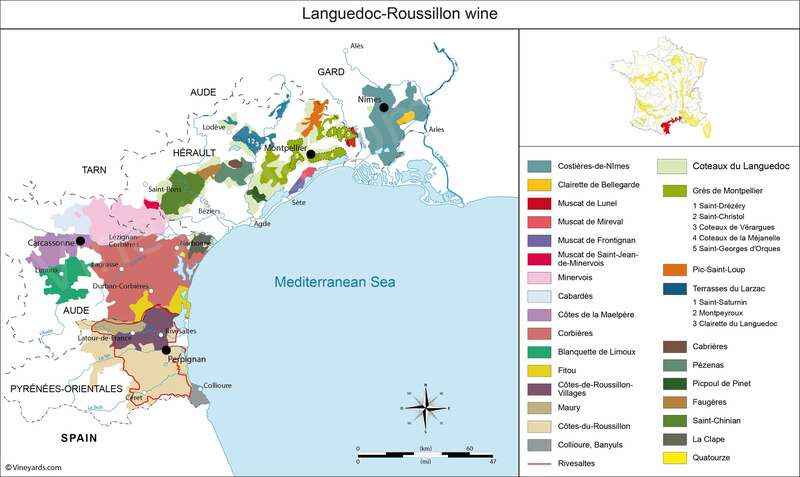 It’s referred to as “Languedoc-Roussillon” and treated as one unit. But they are independent regions with different characters- Languedoc more French and Roussillon more Spanish/Catalan. It’s wide and vast with a plethora of soils and significant topographical diversity on which roughly 200,000 hectares (530,000 acres) of grapevines are planted. 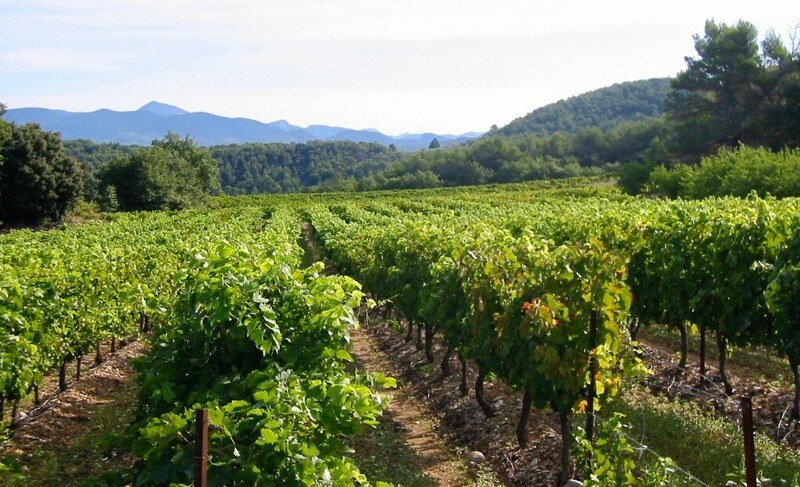 Historically, Languedoc wines were Carignan-based GSM blends (Grenache, Syrah, Mourvédre) however its newer appellations favor Syrah and Grenache. Some winemakers bottle under VDP (Vins de Pays), or IGP (Indication Géographic Protégée), which is the Europe-wide equivalent. VDP/IGP links a wine to geographic origin but in a less precise way than AOP, meaning minimal rules about grape variety percentages, what you can and cannot do, etc. Looser rules mean innovation and experimentation are possible. Two appellations lie within the Languedoc: the Corbières and Minervois AOPs (Appellation d’Origine Protégée). Both are focused on red wines made from Syrah, Grenache, Mourvèdre, Carignan, Cinsault, and Lladoner Pelut in differing proportions. They deliver a small amount of noteworthy whites made primarily from Grenache Blanc, Bourboulenc, Marsanne, Roussanne, Viognier, Vermentino (Rolle), and Maccabeu (Viura). Several other grapes grow there too. Here are the defining characteristics of each. The Minervois is smaller than Corbières where wines tend toward fruit purity, voluminous, less tannic, and easier drinking. One might imply Minervois is a little smoother and suppler than Corbières. Reds are predominantly Syrah based. Soils are clay-limestone, sandstone, marble, and schist. There is one Cru: Minervois-La-Livinière in the northern part of the AOP. 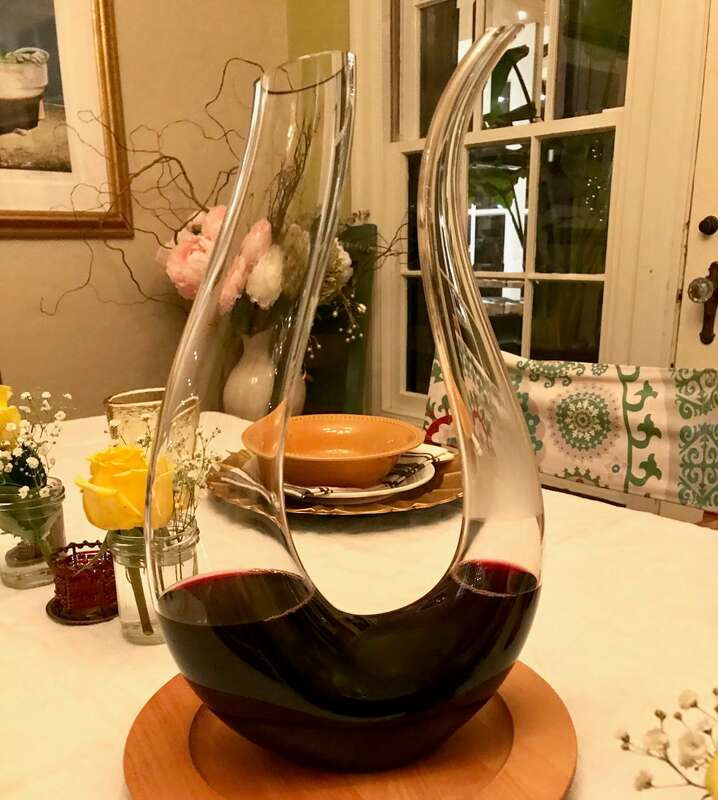 Our host decanted the Château Maris Old School Rouge from the Minervois, such a striking decanter! The biggest sub-appellation in Languedoc and fourth largest in France (in terms of geographical size), Corbières is directly south of Minervois brushing up against the Mediterranean Ocean. Reds are Carignan based, especially old Carignan where it forms part of the Corbières’ character. Carignan can comprise up to 50% of the blend. It has one Cru: Corbiéres-Boutenac. Soil is predominantly limestone. I heard Corbières described as “bolder and wilder” than Minervois. Disclaimer: media samples; all thoughts and opinions are my own. “It could be described as a holistic, ‘supercharged organic’ approach to winemaking”. Super cool, the partners took the sustainability approach further- they built a new, energy self-sufficient winery utilizing hemp bricks. Dana Nigro from Wine Spectator wrote an informative article about their process. The winery website has a great video too. A clean ruby color, the aromas are bright with slightly sweet rosehips and red/black fruits. Another person got crunchy red berries and peanut brittle. And another said if put under her nose blind she would guess it a white wine. This succulent wine with plenty of palate lift had medium acidity and medium minus body. It had a bright, round mouth feel then ended with a rather short but satisfying finish with a touch of tannins. The pairing, mixed bean and beef stew with corn bread calmed the brightness enjoyably. Located in Boutenac, the Château farms organically. They ceased using pesticides, etc., late in the 1990’s and are now ISO 14001 certified. Famile Bories purchased the estate over 200 years ago and continues to farm it today, one of the largest privately owned in Corbières. Carbonic maceration using indigenous yeast, fermentation in cement, no added sulphur. Label drawing done by the winemaker’s son! Carignan, Syrah and Grenache tend to produce fuller and richer wines. But this one is lighter packed with red/black fruits and lower tannins, perhaps from the carbonic maceration. Highlighted aromas of dark cherry, notes of bay laurel and thyme, and cedar spice give way to youthful fruit on the palate. The medium acidity, medium-minus body and medium length finish was bright and lingering. Overall conclusion? A fun and funky in a good way wine. 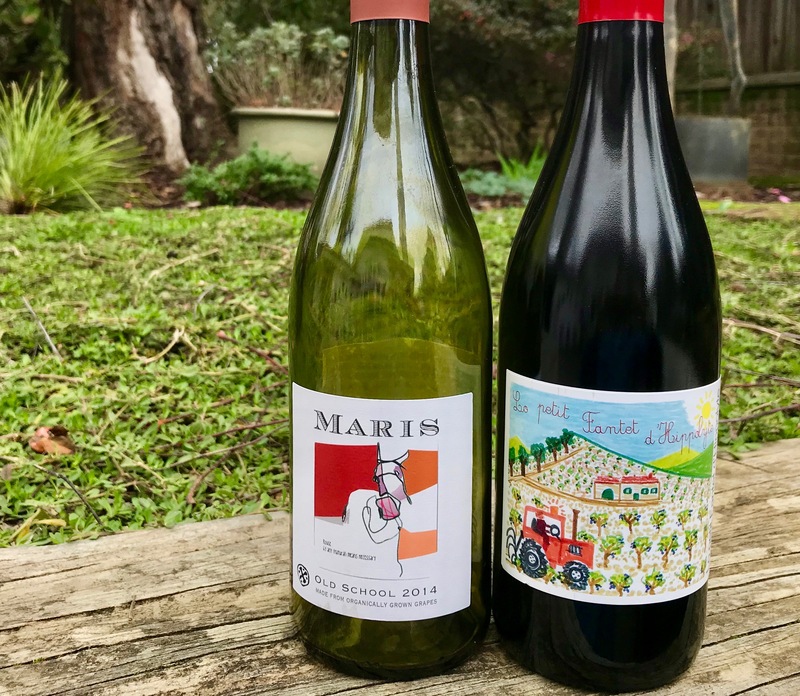 These two organic wines show the fun and funky side of what winemakers are doing with Grenache and Syrah in Minervois and Corbiéres. 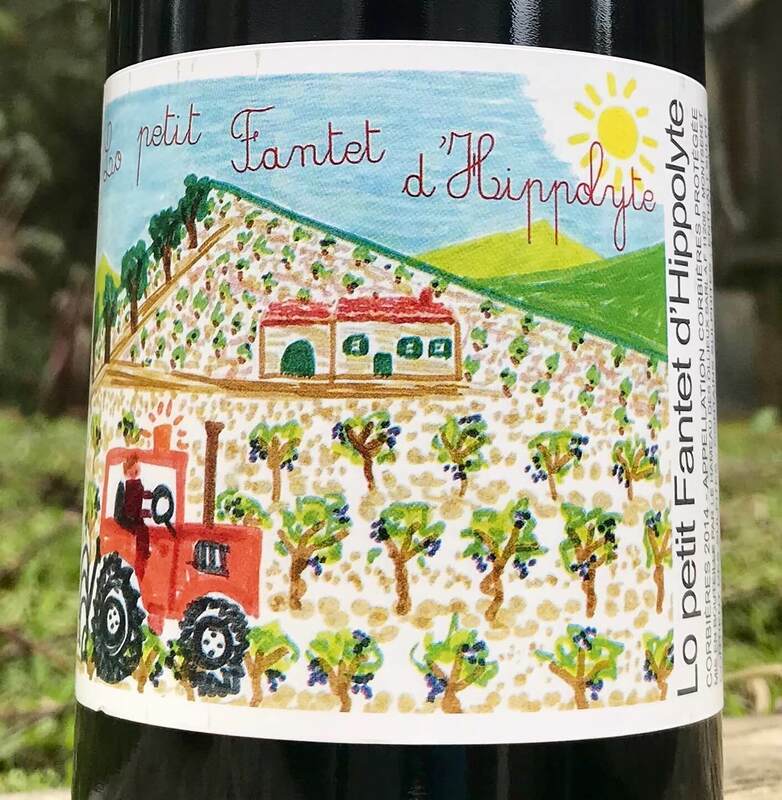 I wouldn’t guess the Maris Old School to be primarily Syrah, but perhaps yes that the Lo Petit Fantet D’Hippolyte has a greater proportion of Carignan. Whether done in a traditional style or the winemaker’s preference, the Syrah and Carignan based wines of southern France are delightful and pair well with a variety of food. The French #winophiles are chatting up Corbières and Minervois this Saturday, January 20 at 8am PT. Anyone can follow on Twitter using the #winophiles hashtag. Thanks for the great post! I always learn so much from this group. And those wines…they look fabulous. And what fun labels! …And I do as well Camilla, creativity galore! Fun post and super-interesting wines you tasted! Fun to see so many interesting wines from Languedoc. Nice job! Thanks for stopping by Liz- the two wines I tasted were indeed interesting, both had a little organic funkiness. I’m hoping to get a few more, also organic and see if it’s common from the region. Cheers! I love that we all got different samples for this event. Your posts are always so informative and I love that your samples were organic. Agree Wendy- our discussions have much depth when each of us taste different wines. Look forward to hearing about your bottles! I love the wines of Maris. They make the best Grenache Gris, a funky wine for wine geeks. You must try. Totally agree Syrah definitely shines in this region. Cheers..
Ah, I haven’t tasted a Grenache Gris from Maris, thanks for the tip Rupal! After reading a few posts, a theme is emerging: the winemakers of the Languedoc are an enterprising crowd, always seeking ways to simplify their processes, get closer to natural methods. Hemp bricks used to build a winery – so cool! Thanks for sharing what you learned with us, Lynn. Well done. The wines sound so fun and unique. And quite different from each other. Thanks for sharing. I too love that everyone got different wines! Great tasting notes and picking up that fun and funk of the winemakers!! It is refreshing to share wine with friends that are not so focused on the “tasting” but simply on appreciating the wine and hearing their straightforward impressions. It was educational for me to hear what my friends said about the wines, will have to do that more. Thanks for your comment Jane! I love all the descriptions and names of the wine throughout Europe. My favorite saying from the US is from the Columbia River Gorge with ”blowing the dogs off the chains”! What cool bottles you discovered! It is such a fascinating place – so rich in every way. This was a fun month and your post offers such great detail to help us dig in. Thank you, Lynn! Not only do Minervois and Corbières, but also southern France presents a plethora of areas and wines to explore. So enjoyed the other #winophiles articles this month. Cheers Jill! Thanks for a great read Lynn…didn’t realized that Languedoc more French and Roussillon more Spanish/Catalan! Cheers! A great rundown of the region! Cheers! Yes, me too! Colorful and festive, you’ve got to love a childs mind! Good description of the wines and the region! Sounds like you had two good bottles. In addition to these, we had several other wines. So interesting comparing Malbec!